I tasted the moonlight before the nutty, for reason of its appearance. It has silver hairy young buds mixed with dark green leaves. The first brew was a quick 10 s pour, light with floral aroma; the 2nd brew was a 1 minute steep, I tasted sourness, bitterness and wood/compose, sour stiff and cinnamon sweet after taste. 3rd and 4th was a minute each, tasted similar to 2nd but less floral. Nutty is the least attractive looking leaves among the 3 samples. It's also the reason I saved it for the last, however to my surprise, it tasted the best of the 3. Quick 1st pour - 10s, clean mouthfeel, very floral, sweet in taste; 2nd was 30 s steep, stronger aroma of floral and fresh mulch, hint of mint, sweet pu-erh like after taste. Both the Snow and Moonlight oolong resemble sun dried peony. 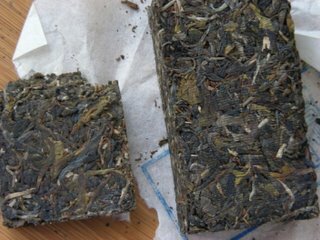 Nutty is high in floral aroma, hence more like a oolong, it's also less oxidized than the other two. My preference is Nutty, Snow and Moonlight in that order. 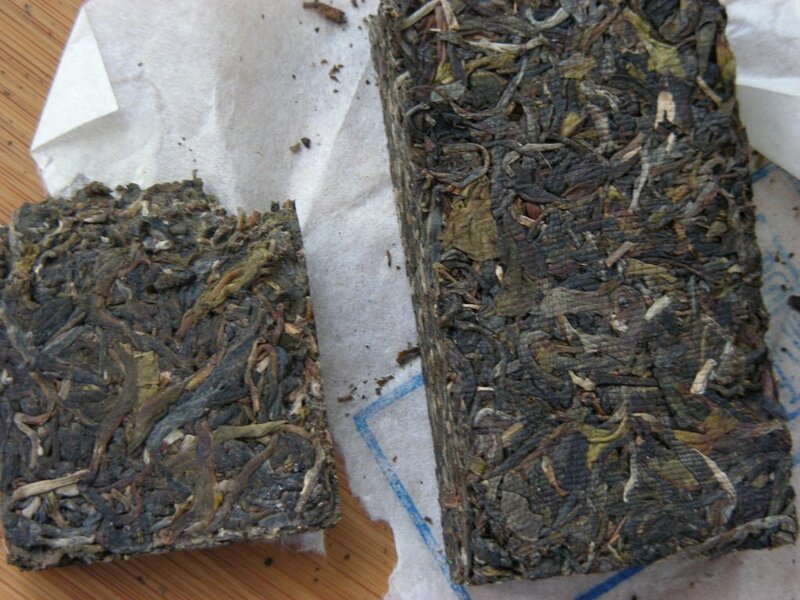 However I won't replace my TGY and high mountain oolong with the Darjeeling varieties any time soon. 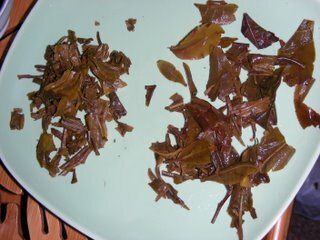 They are more of the European afternoon tea choice, the term oolong associates with these tea does not match the Chinese oolong in "spirit", perhaps a imitation of technique, but without the essence. My father was in China to attend my cousin's wedding. It is nice to have family and friends who fuel my tea obsession. My cousin gave me this unknown age old yixing pot! 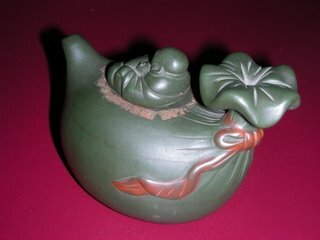 It's very smooth to touch, well seasoned with use, wonderful art work, and I love the mythical representation of the figure. Buddhism promotes the idea of Karma, kinda like a score card through out your life, before life, after life and every life there after, basically eternal; your family can inherit your karma as well, roughly speaking. Monks particularly accumulate good karma by not eating/killing animals, eliminate desires, promote peace, no wrong doing, and so on. Once they reach the level of kindness of god, they become immortal and assume super power in order to continue to do good for the human kind. 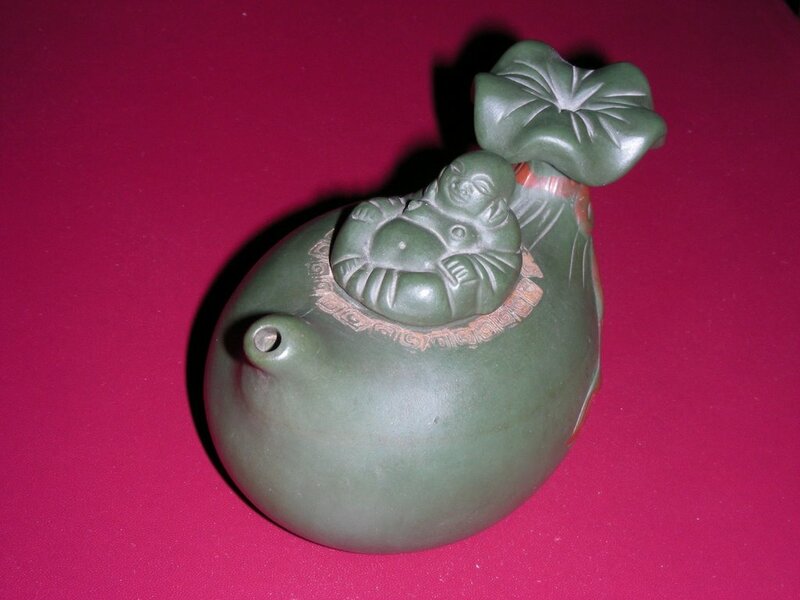 This pot portraits a monk with super power where he's capable of inflating a raggie bag (his luggage/belonging) as his transportation vessel across the sea, fly over the clouds. 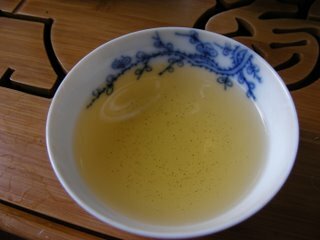 T-ching tasting samples: snow, moonlight and nutty oolong. I'm going to be busy for the rest of the week, so I am going to do a quick tasting of Snow oolong before I leave for LAX. 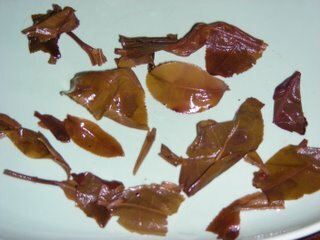 Dry leaves: a lot of white hair young leaves, some what broken, sign of fermentation. Boy that was as far as I could get on Tuesday! Almost a week later (Sunday night), here I attempted the second tasting. Started off with floral, hint of sweetness but not lasting; the second brew was more amber in color, compose and some leather hint, medium to crisp body, reminds me of my orchid barks; 3rd brew, compose taste is getting stronger and bitterness is noticeable; 4th, losing flavor rapidly, after taste is a little sweet mulchy. 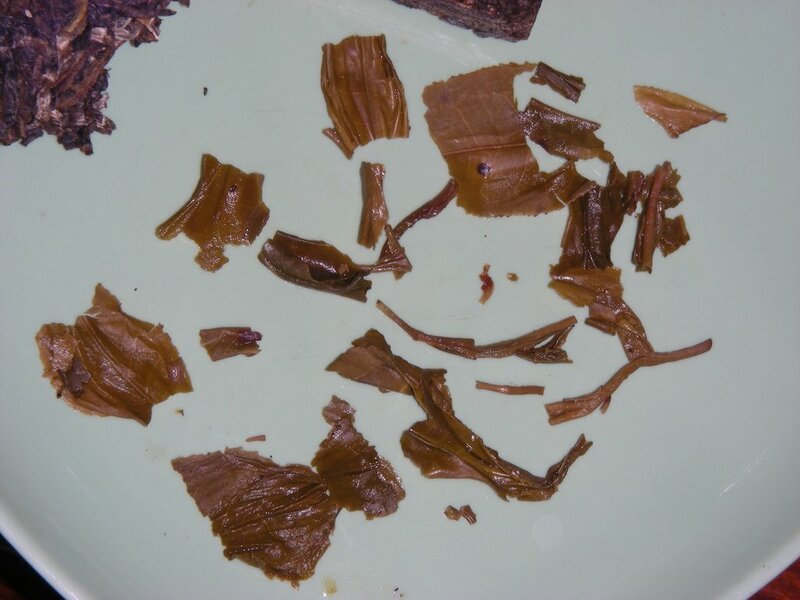 This tea resemble Sun dried white peony more so than oolong, both in appearance and flavor. I am really short on time, so I'll skim on the pictures. Chinese New Year is this Sunday, so it's time to clean house! As a result, I packed up some clothes that I no longer wear, drove them to a local thrifty shop for the Aids foundation. Okay, I don't know where Goodwill is. 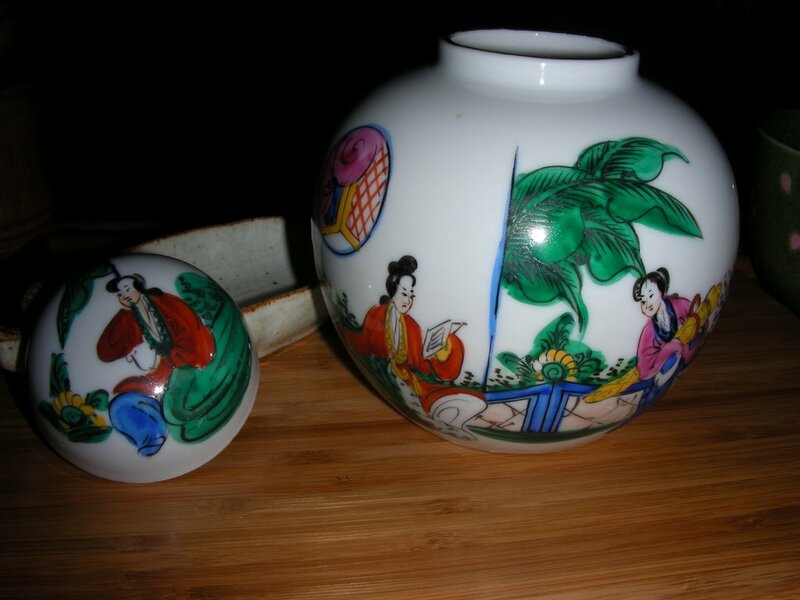 Anyways, I found this little ginger jar, made in Japan, decorated in Hong Kong by Y.T.. One man's trash is another woman's treasure?! I'll use it to store my 9 yrs old loose pu-erh. I bought a 2005 brick last year and liked it a lot, so I bought a lot of 10kg of the 06 bricks for aging. Although I had both tea today, my focus was away from tea, so I can't give accurate tasting notes at the time being. Pictures below show the difference of the two. Left 05, right 06, both look about the same, however 06 seems a little less compressed than 05. I can break off the 06 rather easily in large pieces of leaves. Left 05: Small broken leaves, this could be from my clumsy technique of breaking the brick, also I am currently prying the middle of the brick. Right 06: Some whole leaves can be seen, consist of both young and old leaves. Closer look of the 05 wet leaves. Closer look of the 06 wet leaves. Both are similar in color, light amber.